The beautiful handmade Fargo Tiffany wall lamp. 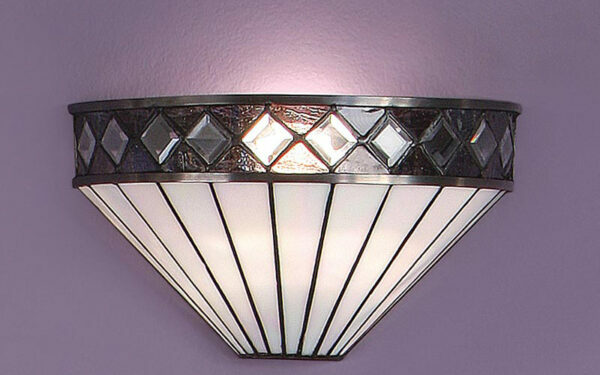 A half round flush fitting Tiffany wall light made from opaque triangular glass sections. Feature effect rim of diamond shaped clear glass with translucent rippled ambers with hints of green giving almost a metallic appearance. From our hand crafted Art Deco style Tiffany wall light collection by Interiors 1900. A half round Tiffany wall light with the charm of Art Deco Style. Eye catching – Stunning – Tiffany.